Help the Texas Hurricane Victims – Donate Now! Help the Texas Hurricane Victims – Pray Now! Donate Now! As of Tuesday, August 29, Hurricane Harvey has claimed 10 lives with inundating rain continuing today into Wednesday, dumping up to 50 inches of water into southeast Texas. Gov. Greg Abbott says Harvey is “one of the largest disasters America has ever faced.” All this and Hurricane Harvey hasn’t yet made landfall. 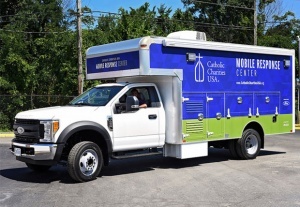 Catholic Charities USA is on the scene providing disaster relief.